So you might be fine with getting up and presenting – you may be comfortable to speak confidently in front of a group. But you’ve been asked to speak on a specific topic, there’s plenty of material but where do you start to create this presentation? Here are four easy steps to follow to get all the information you need together to prepare your presentation. Read through all your material and write down all the main points around the central theme. Then you choose the top three that are most important. Your audience can remember three main points – so go with that – anymore and your audience will start to forget some of the information. 3. Work on the three points you are going to cover. 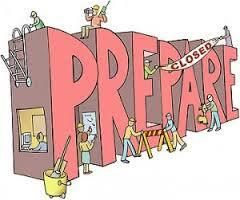 Prepare all the relevant information and cut or increase depending on the time you have available. 4. Then prepare a strong message for the conclusion – give an overview of the three main points and then finish with a really strong message. Remember to Practice after you have written your presentation and then you’re ready. Now, you can go confidently and present. All the Best !